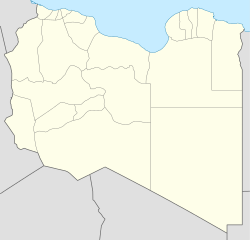 Zliten (Arabic: زليتن‎ Zlīten) is a town in Murqub District of Libya. It is located 160 km to the east of Tripoli. The name Zliten is given to both the town and the whole area. As a town, Zliten is situated 160 km (99 mi) east of the capital, Tripoli, and about 35 km (22 mi) east of the ancient Roman city of Leptis Magna. It is about 60 km (37 mi) west of the city of Misrata and 40 km (25 mi) east of Khoms. It has spread over an area of about 8 km2 (3.1 sq mi). The ex district of Zliten is widespread and covers an area of 3,000 km2 (1,200 sq mi). It is surrounded by the Mediterranean at the north, Misrata at the east, Bani Walid at the south and Khoms at the west. Zliten is home to one of Libya's most renowned Islamic universities, Al-Jamiaa Al-Asmariya (Arabic: الجامعة الأسمربة الإسلامية i.e. Al-Asmariya Islamic University). It includes a number of faculties; Faculty of Arts, Faculty Sciences, Faculty of Economics and Political Sciences, Faculty of Dentistry and Mouth Surgery, and Faculty of Education. There is also a higher vocational training center covering various engineering fields. Zliten has several modern banking institutions, a major shopping center and the Zliten Hotel, the city's top accommodation for tourists. In 2001, the Libyan Government proposed a number of state company projects for which joint ventures would be considered. These included an expansion of Arab Cement Company’s (ACC) cement plant in Zliten valued at $169 million. In February 2005, the initial public offering of shares in the formerly state-owned ACC resulted in the sale of 60% of the company. ACC proposed to build a second 1-Mt/yr-capacity cement production line at its Zliten plant. Arab Union Contracting Co. (AUCC) commissioned a 1.2-Mt/yr-capacity cement clinker plant near Zliten in December 2004; commercial production began in September 2005. AUCC began a feasibility study for the construction of a second clinker production line at its production facility. In 2004, construction began on extending a seawater desalination plant in Zliten with a total capacity of 10,000 cubic metres (8.1 acre⋅ft) per day using the multi-stage flash distillation process. There are many ancient Roman sites in Zliten, such as the Villa of Omira ('Darbuk Omira' ), and the Castle in Al-Jumaa. The town also contains the Mausoleum and Mosque of Abd As-Salam Al-Asmar, Mosque of Abu-Minjal, Mosque of Albaza and many other mosques. There is some fine Arabic calligraphy in sandstone on top of the outer pillars of the building saying al-mulk-'illah ("Everything to Allah"). The town is famous for its olives, palm trees and citrus fruits along beautiful coastal shores. The Slat Abn Shaif Synagogue (Hebrew: בית הכנסת צלאת בן שאיף‎) in Zliten was a historic synagogue and Lag Ba'omer pilgrimage site for Libyan Jews. It was over 900 years old and was destroyed in the 1980s by Gaddafi and replaced by apartments. On Friday, 24 August 2012 the shrine of Sidi Abdul-Salam Al-Asmar Al-Fituri suffered extensive damage at the hands of violent Salafists. Muhammad al-Madkhali, a cleric of the Madkhalism movement, praised his loyalists who'd carried out the act and encouraged other Salafists to engage in similar attacks. This action was condemned by the Grand Mufti of Libya, Abdelrahman al-Gharyani, and 22 organisations in Libya, including Lawyers for Justice in Libya (LFJL) and Arabic Network for Human Rights Information (ANHRI), as well as the UNESCO Director-General, Irina Bokova. Zliten has a proliferation of date palms that yield what is considered by many to be the best rubb (date juice) in Libya. Tarbuni is often served with the most famous local dish asida, made from flour, boiled with salt, and eaten with olive and date juice. Asida is usually served as a quick meal for cold nights in winter. It is usually reserved to commemorate important religious occasions such as the birth of the Islamic prophet Muhammad. Asida is also the celebratory dish of choice for Tripolitanian families when a child is born. On January 7, 2016, during the Second Civil War, a truck bomb killed 60+ police officers and wounded over 200 at a police training camp in the town. Wilayat al-Barqa, an affiliate of the Islamic State of Iraq and the Levant in Libya claimed responsibility for the attack. ^ Enas Saddoh, Extremists demolish Libya’s shrines using bulldozers, explosives. France 24, 29/08/2012. ^ Mawlid al-Nabi, the birth of Muhammad, is celebrated on the twelfth day of Rabi al-Awwal. Esposito, John L. (2003). "Mawlid al-Nabi". The Oxford Dictionary of Islam. New York: Oxford University Press. p. 198. ISBN 978-0-19-512558-0. ^ Kirkpatrick, David D. (11 June 2011). "Pro-Qaddafi Forces Shell Rebels Near Misurata". The New York Times. New York: NYTC. ISSN 0362-4331. Retrieved 13 July 2014. ^ "Libya rebels inch closer to Tripoli". Oman Tribune. Retrieved 13 July 2014. ^ "Nations Formally Support Libyan Opposition". SkyNews. 15 July 2011. Retrieved 17 July 2011. ^ "U.S. recognizes Libyan rebels' authority". CNN. 15 July 2011. Retrieved 17 July 2011. ^ "Video : Libya government: NATO air missiles targeted children's Hospital in Zlitan". uruknet.info. 5 August 2011. Retrieved 13 July 2014. ^ "WRAPUP 1-Tripoli says NATO strike kills dozens of civilians". Reuters. 9 August 2011. ^ "Libyan rebels capture city near Tripoli". Al Jazeera English. 19 August 2011. Retrieved 19 August 2011. Wikimedia Commons has media related to Zliten.